In 2018, the Government of Canada (the "Government") launched the five-year Intellectual Property ("IP") Strategy to ensure that businesses, creators, entrepreneurs and innovators have access to the best possible IP resources through: IP awareness, education and advice; strategic IP tools for growth; and IP legislation. The Patent Collective, a $30M, 4-year pilot project designed to assist participating small and medium-sized enterprises (SMEs) with their patent and other IP needs, is a key part of the IP Strategy. The Patent Collective will help its membership better leverage IP in their drive to grow to scale and will also provide the Government with insight to better support SMEs in this regard going forward. As the Patent Collective is a pilot program, participants will have an opportunity to shape how it will support member businesses, customize services to suit members' needs and innovation environments, and identify how best to support the strategic use of IP in scaling businesses. The Government is looking to identify an entity, who, through a not-for-profit corporation, would undertake day-to-day operation of the Patent Collective program with a view to achieving the program's objectives. To position the program for success, the ideal applicant will understand the complexities of IP and its role in fueling business growth. Moreover, they will have deep experience providing IP advice and strategy to businesses, particularly SMEs operating in a patent-intensive technological sector or subsector. To maximize the Government's investment in the Patent Collective program, the ideal applicant will also have past experience running a business, particularly a client-facing enterprise across any given business vertical. While not directly involved in administering the Patent Collective, the Government will exercise ongoing oversight of the program. 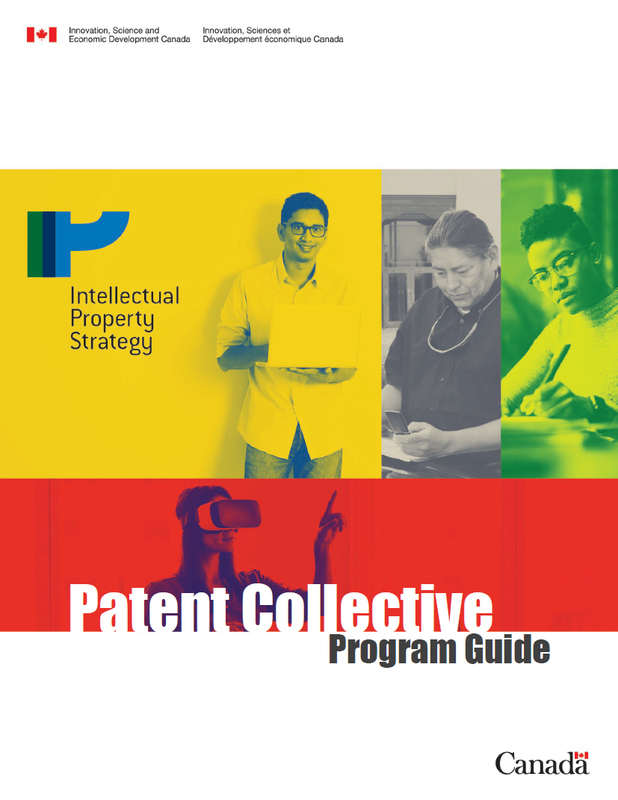 Entities with the requisite experience and a desire to establish and administer the Patent Collective program are invited to submit applications addressing the criteria outlined in this program guide. The Patent Collective program has two overarching purposes. Firstly, it will seek to help SMEs operating in a dynamic technological area grow to scale by supporting their patent and other IP needs. Secondly, it will provide the Government with valuable insight into the IP issues faced by SMEs. Recruitment of SMEs operating in a chosen technological space and wishing to become fee-paying members of the Patent Collective program and use its services to better educate themselves on patent issues and build strategic IP considerations into their business strategies to facilitate growth. Development of specialized insight into the patent and broader IP issues faced by SMEs operating in the chosen technological sector, thereby distinguishing the Patent Collective program from private sector service providers. Identification of possible opportunities for collaboration and cooperation between members to better leverage existing and available IP. This may include patent landscaping and identification of adjacent and necessary background IP for the given sector. Detailed reporting on the Recipient's operations to measure the success of the pilot program and provide insight into how the Government can best support SMEs with their patent needs going forward. Sound management of committed Government funds and cost-effective provision of services to members. A Canadian entityFootnote 1, (the "Applicant") who has assembled a team with the requisite professional qualifications and experience to deliver high-quality patent advice and strategy may apply. Proof of such qualifications and experience may be required. The successful Applicant will be required to incorporate a not-for-profit corporation pursuant to the Canada Not-for-profit Corporations Act which will serve the needs of its Patent Collective membership. The not-for-profit corporation will become the recipient (the "Recipient") eligible to receive funding pursuant to the program. b. What is the program intended to do? The Patent Collective pilot program is intended to help SMEs grow to scale by supporting their patent and other IP needs, including increasing the sophisticated and strategic use of such assets. The Patent Collective will also provide the Government with insight into the patent issues faced by SMEs. The Patent Collective is intended to assist businesses that might not otherwise be able to access or afford the services of patent lawyers, agents, and other private sector service providers. More importantly, it is intended to leverage the benefits of operating as a collective, informed by the experiences of different but similarly situated members. It is the aim that this collective approach will use scale and shared learning to significantly increase the sophisticated and strategic use of IP and to reach outcomes faster and more cost-effectively than businesses acting alone. Within this framework, the Government believes there are different ways of assisting businesses and different services that could be provided. To best position the Patent Collective program for success, the Government, in soliciting applications, is seeking input from entities to determine how the Patent Collective, as a not-for-profit corporation, can best be structured to achieve the program's objectives. More details on the type of information to be provided in an application is further described in the "Application and Selection Process" section of this document (Section 3). c. Who will receive funding? The Recipient will be eligible to receive funding as further described below and pursuant to a contribution agreement with the Government (the "Contribution Agreement"). it must include in its governing documents, as a qualification for membership, that each member shall be either: a Resident Canadian, a Canadian Owned Company or a Canadian Partnership. The Recipient will, upon achievement of certain milestones specified in the Contribution Agreement, receive the entire $30 million allocated to the program in its first year of operation (i.e. Fiscal Year 2019-2020). It will be the Recipient's obligation to manage the allocated funds until such time as they are spent. The Recipient will also be responsible for collecting and managing membership fees from its members. The Recipient must be in a position to justify all expenditures and demonstrate that services were provided in a cost-effective manner. If the Recipient can serve member needs while spending less than the allocated amount, it must do so. If at any point the Government concludes that expenditures were not justified or that services were not provided in a cost-effective manner, it may terminate the program at its sole discretion and require repayment of all unspent amounts. At the conclusion of the pilot project, all unspent allocated funds shall be returned to the Government. Whether the Government seeks to renew or expand upon the pilot project after its completion will depend, at least in part, on whether the Recipient is able to provide services in a cost-effective manner. The Recipient is required to adhere to reporting requirements articulated in the Contribution Agreement, including gender and diversity requirements. At a minimum, the Recipient will be required to report on any specific challenges around gender and diversity encountered by the Patent Collective program and steps taken to ameliorate these concerns. Eligible costs may also include expenditures directly related to activities of the Recipient in administering the program, such as the costs related to the organization of networking events, conferences, and workshops in support of the Patent Collective's objectives. They also include those related to the operation of the Patent Collective, such as salaries, office equipment, professional services, overhead, and travel. Eligible Costs and Ineligible Costs will be further described in the Contribution Agreement. Applications may be submitted by email to ic.ipstrategy-strategieenmatieredepi.ic@canada.ca until March 15, 2019. No extensions of this deadline will be provided. Provide a high-level overview of the proposed approach and how it will meet the two overarching objectives of the Patent Collective Pilot Program. Propose a particular technological sector or sectors the Patent Collective program would serve. Applicants should explain why the sector has been proposed instead of other sectors, including the possibility and benefits of collective action within the sector. Where appropriate, Applicants should explain the IP needs within the sector, any challenges faced by the sector in obtaining advice from existing service providers, any unique IP challenges faced by firms operating in the sector, litigation trends within the sector, a high-level overview of the market for patents in the sector, the major markets in which the sector operates and any IP challenges within those markets, and/or any other information that would help the Government understand why the proposed sector should be preferred. If possible, Applicants should estimate the number of SMEs in the proposed sector who can be expected to join the Patent Collective program and, if possible, the names of those entities who may have been approached in the preparation of the Application. Explain the types of services the Recipient will provide (e.g. IP education, patent landscaping, patent prosecution, freedom to operate analysis, identification of internal and external licensing opportunities, etc.) and the advantages of accessing these services through the Recipient rather than via private sector service providers. Demonstrate how the Patent Collective program might be used to facilitate greater use of the IP system by women, indigenous groups, and other underrepresented communities which have, historically, made less frequent use of the IP system. Explain how services will be delivered (e.g. using exclusively in-house staff, retaining outside service providers to deal with select issues, etc.). If in-house service delivery is proposed, Applicants should explain their qualifications and capacity to provide all such services, including the number and type of employees likely required to provide such services. Identify, in light of the services the Applicant proposes to provide, possible conflicts of interest that could arise within the Patent Collective program (e.g. how the Recipient would advise members competing in the same space on sensitive IP or business issues) and explain how any such conflicts would be addressed. Taking into account the requirements set out in Section 2(c) above, explain contemplated terms of membership in the Recipient/Patent Collective program (e.g. the role, if any, of members in governance of the Recipient, how the Recipient will attract new members, whether multiple tiers of membership are contemplated and the details of any such tiers, how potential conflicts between existing and prospective members will be addressed, etc.). In particular, the Applicant should outline how benefits will be distributed and how rights and conflicts over rights will be addressed. Explain the estimated annual cost of membership in the Patent Collective program, including any tiered membership fees. Applicants should explain how membership fees will contribute to the financial operation of the Patent Collective program, including whether membership fees would provide a sustainable base for ongoing operation of the Patent Collective program after the pilot project has concluded or whether other sources of future funding would be required and what such sources may be. Explain how funding will be used over the four-year period. If a range of services will be provided to members, Applicants should explain the proportion of allocated funds that will be spent on each service. Applicants should also provide an estimate of the actual annual cost per member of providing the service, including administrative costs and staffing. Explain, in general terms, how the Applicant will account for the cost of providing services and ensure that services are provided in a cost effective manner. Explain how information on members' IP needs will be collected and reported so as to achieve program objectives. Applicants should identify potential challenges in collecting this information (e.g. potential member concerns about disclosing sensitive business information) and how these challenges will be addressed. Provide a high-level critical path that would be followed leading to operationalization of the Patent Collective and when milestones in this process would be reached. To facilitate evaluation of the applications, Applicants should provide, where appropriate, the factual basis of their responses. An attestation from key executives of the Recipient indicating that any contributions from the program are not included in the evaluation of, nor be used for, executive performance pay. Applicants must mark any commercially confidential information in its application as such. Evaluation of applications will begin after expiry of application period specified in Section 3(a) of this document. Applications will be assessed on the likelihood that the proposal will achieve program objectives. Particular emphasis will be placed on how applicants meet the requirements set forth in Section 3(b) of this document and the extent to which each aspect of the proposal is integrated with every other aspect of the proposal. Applicants' knowledge of the sector to be served, experience providing the proposed services, and experience operating a not-for-profit entity will also be considered. In evaluating Applications, the Government may solicit further information from Applicants. After all applications have been evaluated, the Minister of Innovation, Science and Economic Development Canada will exercise his discretion and select one Applicant to establish and administer the Patent Collective as Recipient, a not-for-profit corporation as further described in Section 2(c) above. Reporting requirements detailing the Patent Collective's activities, including details regarding membership outreach and growth, the nature and number of services provided during the reporting period, and lessons learned about IP needs in the selected space. Obligations governing management of the distributed funds. A requirement to prepare a final report on the results of the pilot project. The entire $30 million allocated for the pilot project will be distributed in the first year of the program, after milestones specified in the Contribution Agreement have been met. No funds will be advanced prior to the Contribution Agreement being signed and the Recipient must be able to independently fund its operations until such time as the first milestone has been met and funds are distributed. The Recipient will be responsible for managing the allocated funds and returning all unspent amounts at the conclusion of the pilot project or at an earlier date contemplated in the Contribution Agreement. The Recipient will be required to submit periodic reports, annual consolidated financial statements, and repayment forecasts (if applicable), project status updates and reports of project benefits. After the completion of the project, the Recipient may be required to submit annual consolidated financial statements and, annual reports on project benefits including fulfilment of specific commitments. The Patent Collective is administered according to Canada's international agreements. Contributions are not contingent, in law or in fact, on actual or anticipated export performance. A partnership of two or more of the following: Resident Canadians or Canadian-Owned Company ("Canadian Partnership").